Residential or commercial: Which is the most prospering segment? Is the public or the tourism sector, process heat or multi-family houses the most prospering segment in a particular country? Which application is responsible for the highest sales of your competitors? Will the commercial segments - multi-family houses, tourism or industry - surpass the market share of single-family homes in 2020? Find the answers in the 18 country portraits of the ISOL Navigator December 2015. Which market segment has the highest share on your sales in 2015? Which is the fastest growing market segment in your national market? 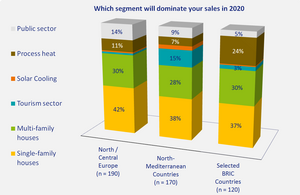 Which market Segment will dominate your sales in 2020 in your national market? The results show a clear shift away from the residential segment towards commercial applications in many countries.